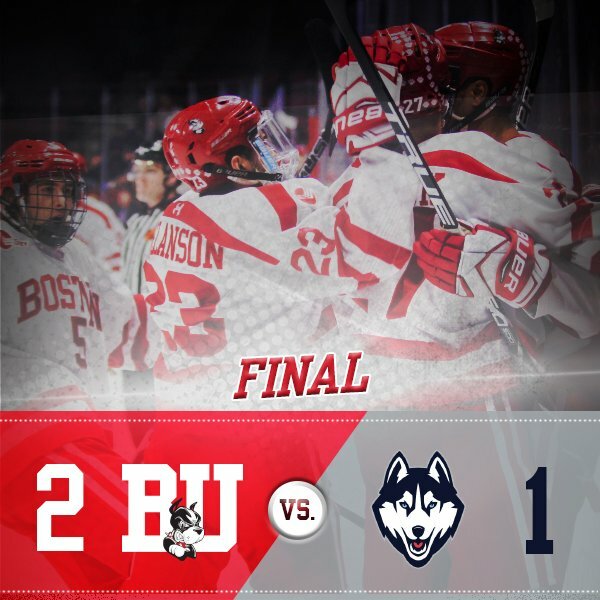 On the strength of 36 saves by Jake Oettinger and goals by freshmen Brady Tkachuk and Logan Cockerill, BU completed a sweep of Connecticut in the Hockey East quarterfinals, earning a spot in the semifinals next week against Boston College. The victory was the Terriers’ 12th consecutive home playoff win and puts BU in the semis for the 14th time in the past 17 years. BU took a 1-0 lead in the final minute of the first period while on a power play. Tkachuk won a battle to control the puck in the corner, slid it to Dante Fabbro at the right point and then wristed a return pass home from the bottom of the right circle. Midway through the middle period, UConn tied the score. With BU overcommitted to one side of the ice, defenseman Joe Masonius took a pass close to the top of the left circle. His slapper was deflected past Oettinger by Max Kalter. Late in the period, Shane Bowers intercepted a pass just inside the UConn blueline, moved toward the high slot and found Cockerill on his off-wing below the right circle. The freshman held the puck until goalie Adam Huska committed and then whipped a shot high into the net. Facing elimination, the Huskies poured 15 shots on Oettinger in the final period—without the benefit of a power play—but the junior from Minnesota was up to the task. ► With his goal, Cockerill is on a 10-game scoring streak, with 4 goals and seven assists over that period. ► Friday’s semifinal vs. the Eagles is the early game, starting at 5 p.m. ET and will air on NESN and be streamed on ESPN3 outside of the New England area. Terriers received a commitment from St. Sebastian's junior power forward Liam Gorman for its 2019 class yesterday. The 6'3", 195 lb. 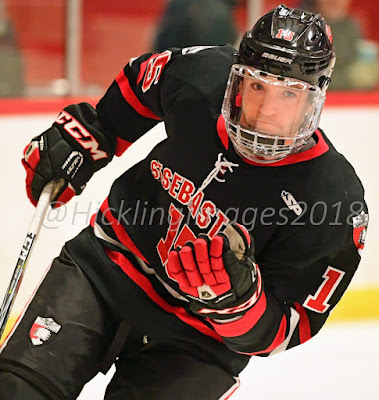 native of Arlington, Massachusetts is a left-shot center, who scored 33 points (17G, 16A) for the Arrows this season, and a teammate of a pair of 2020 recruits, sophomore goalie Drew Comesso and forward Liam Connors, also a sophomore. Former Terrier Mike Grier is an assistant coach at St. Seb's. A physical presence who is strong in the faceoff circle, Gorman was drafted by USHL Chicago and suited up for one game with the Steel (joining future teammate Robert Mastrosimone) this season. He skated in two USA Hockey development camps and played for the East Coast Wizards 16U team. Gorman’s father, Sean, was a defenseman at Princeton, who was drafted by the Bruins and played five seasons of minor-league hockey. Last spring, SB Nation named Gorman the top uncommitted 2000 birthdate in Massachusetts. 1. Liam Gorman, #12 Red, Shoots Left, 6-3/192 - He’s grown and his game has really taken off. He is an explosive skater and looks like a freight train coming down the sheet. He has a heavy shot, is willing to go to the dirty areas and plays a heavy game. He doesn’t score as much as some might like, but that will come. He’s slated to be back at St. Sebastian’s. He’s on Chicago’s USHL affiliate list. St. Sebastian's '00 center Liam Gorman commits to BU. Great get for Terriers. Power forward, plays heavy, goes to the net, wins face-offs. Father played at Princeton. 2018 recruit Jake Wise scored a goal and added an assist in the NTDP U18s’ 8-2 win against Tri-City. Fellow recruit Joel Farabee also scored for Team USA. Since returning from an injury, Wise has been on a nearly point per game pace, with 23 points in 24 contests. Farabee, second on the team in scoring, has 52 points in 48 games. Former BU co-captain and 2018 U.S. Olympian John McCarthy scored a hat trick and added an assist in the San Jose Barracuda’s 6-2 win of AHL Cleveland.